Museums, heritage sites and historical places include Aboriginal and European sites through-out the Byron Bay, Tweed Valley, Gold Coast Region of New South Wales, Australia. These can include landforms and places of significance, as well as buildings and built structures. Historical Societies, often housed in the same building as the local historical museum, can usually provide research services at a nominal or reasonable cost. Museums and historic buildings are often open on set days or by arrangement for groups and schools, while historic places may have interpretive signage of their significance. Cape Byron Headland Reserve stands on the most easterly point of the Australian mainland, with a spectacular cliff top walking track offering panoramic views of the ocean and north coast hinterland. The visitor centre and lighthouse tours are managed jointly by the Trust and NSW NPWS. Vehicle park fees apply, pedestrian access is free. 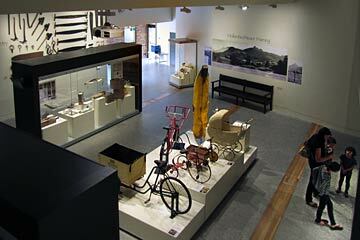 Displays showcase the patterns of settlement, industry and agriculture that have shaped the Valley, and provide insights into contemporary life in the Shire. School groups and special interst groups welcome by arrangement. A NSW NPWS Historic Site open daily, features a mangrove boardwalk and walking track winding through the site and free use of picnic facilities with electric barbecues. The Cultural Centre has a museum and a shop offering aboriginal art, crafts and souvenirs. The shop and museum are open Monday to Friday, 9am-3pm. Museum entry $15 per adult, and $7.50 concession and children. Private tours, small groups, school groups and special interest groups of 20+, are welcome. Indigenous guides are available by arrangment, to provide guided interpretive tours through the museum and site with its relics, flora and fauna. $p.o.a. Open: 9.30am-3.30pm Wednesday and 1st Sat. February to end of 2nd week of December. Fridays: 10am-12pm & Market day 3rd Saturday: 10am-1pm. School and Group visits by appointment. Lisnagar Heritage Homestead by appt.